The former tánaiste is retiring as a TD at the next election. EAMON GILMORE HAS said he would have preferred to have remained on as tánaiste and Labour leader last year as he discussed his decision to step down as a TD at the next election. The former tánaiste announced yesterday that he will stepping down as TD for Dún Laoghaire at the next general election having been first elected to the Dáil in 1989. “I would have liked to have finished the game, but I was carrying a lot of injuries from the first half and I decided to bow to the inevitable,” Gilmore said of his decision to step back from frontline politics this time last year. Speaking to Seán O’Rourke on RTÉ Radio this morning, Gilmore said his decision to retire from the Dáil was one he kept changing his mind about, but he felt quitting was the “right decision to make”. He insisted he was not stepping down over fears he might lose his seat at the next election, expressing confidence that Labour could retain the Dún Laoghaire seat. Nobody goes on forever. At some stage I was going to have to decide to finish with politics and I decided now was the appropriate time to do that. It gives the party the best part of a year to put a new candidate in place. He said his decision to resign as leader after last year’s disastrous local and European elections performance was borne out of a desire not to put the party through the “trauma” of a leadership battle. My relationship with Joan Burton is good. She is the leader of the party I support her and I wish the party well and I will be working for the party at the next election. Gilmore said that he knew that entering government with Fine Gael would be “really challenging” for the country and for the party. He said that the difficult decisions taken had “enabled the country to recover” and insisted that “Labour will do signficiantly better than some people are predicting” at the next election. Asked about what he plans to do next, Gilmore said that he had not decided and that there are no offers lined up. “I saw somebody tweeting ‘Gilmore for FIFA’. I am not going to go that road,” he joked. Asked if he might consider running for the presidency he expressed the view that President Michael D Higgins will run for a second term. Email “Eamon Gilmore: I wanted to finish the game, but I was carrying a lot of injuries”. 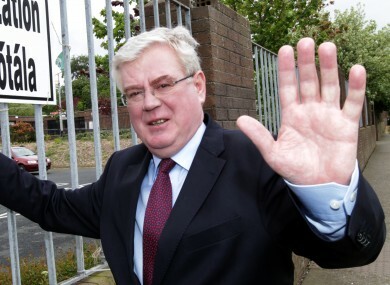 Feedback on “Eamon Gilmore: I wanted to finish the game, but I was carrying a lot of injuries”.